Now is the time to think about things that begin with v. Why? 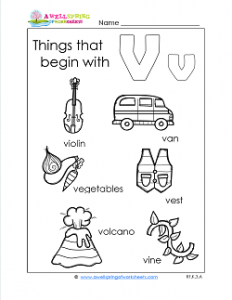 Because if you’re looking at this page, you’re probably thinking about teaching kids about the letter v. The v words that are on this worksheet are violin, van, vest, vegetables, vine, and volcano. Have your kids “read” the words using the picture clues, take an extra minute to sound out the v for each one /v/, /v/, circle the v at the beginning of each word and use their best coloring skills to color the pictures.